Got woken up at about 5 am this morning by some very strange noise it was a bit like something scratching or dripping onto the plastic covered chair in the room so I put the light on to see, no nothing was dripping and I couldn’t see anything so I turned the light off and rolled over. Then I started to wonder if it was a rat in the room and it was inside the underside of the other bed in the room! Not really wanting to share my room with a rat I decided to investigate more and turned the light back on, it was a cockroach obviously doing its dieing swan song! It was on its back but kept jumping up as if to right itself but just kept landing on its back! 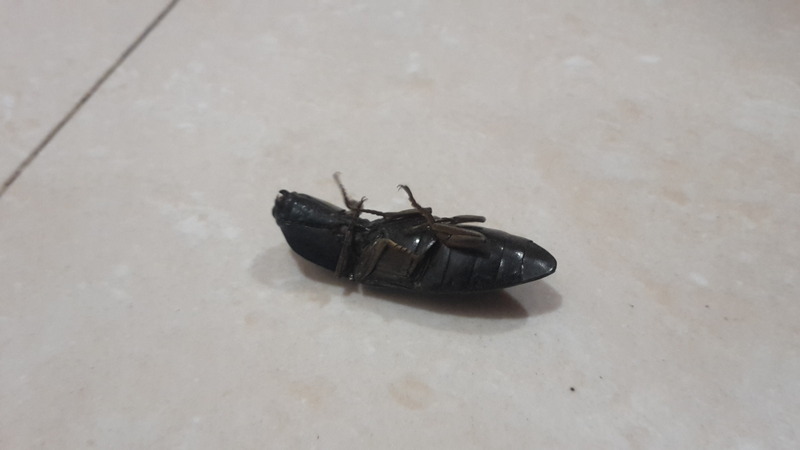 Anyway it fell silent after about 10 more minutes and I found it dead on the floor when I got up! I set off as normal this morning and only got a short distance down the road when I started to feel really bad again, I was hot and the sweat was just pouring off me and I was very short of breath! I continued on for a bit more but it was no good I really wasn’t feeling good! I decided to stop at one of the many street stalls that sell food and have a bite to eat whilst I decided what to do! Carry on and just ride it off, but then I’ve not really been feeling that good since I started it’s seems to be getting worse rather than better! Take it easy and do even less miles than I’ve already been doing! Or should I go back to the hotel I stayed at, at least it was a pleasant place, fairly modern with good wifi and I knew my bike was safe. (We moved it into reception in the end last night) And if I was going to be ill I could have a bit of comfort! Also I’m sure that they would be able to get a doctor if I needed one! Decisions decisions! I continued on for another half mile but in the end I went back to the hotel thinking that it was probably the best idea. When I got back they called a doctor out for me. The doctor came out a few hours later along with the hotel owner, the hotel manager, a junior doctor and somebody else who I didn’t know was, probably somebody passing by wanting to have a look at the poorly english man! The main doctor listened to my chest, felt my forehead and felt my pulse asked me a few questions and then asked the junior doctor to give me an injection in my bum! He did tell me what it was but I didn’t really catch what he said! Next somebody else came into the room who took some blood from me to take away for tests. An hour or so later the blood tests came back with the hotel manager, not the doctor as you’d maybe expect! Anyway not too sure what’s a matter with me but they’ve given me some antibiotics and some other tablets and told me to rest! 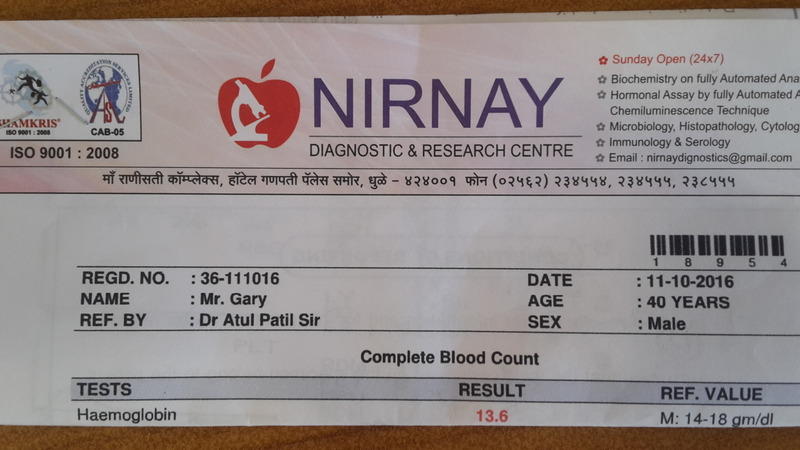 The results of my blood test, please note the age they thought I was! Spent the rest of the day sleeping on and off. Think I may still be here tomorrow! Tant pis! Perhaps it will immunise you for the rest of the journey. Nice posts. I hope so, maybe I’ll be able to get some miles in then rather than lying around on a bed! Sorry to hear you aren’t well!! Pleased you made the right decision to return to the hotel!! Thanks Liz just typical to get ill when I’m away! Still hopefully another day or two of rest and I’ll be back on the road! 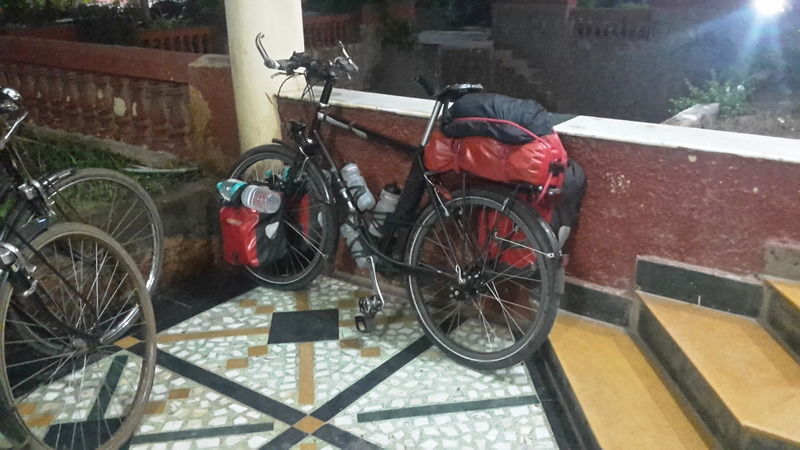 Previous PostPrevious Cycle Touring India Monday 10th October. Malsne to Dhule. 64 miles. 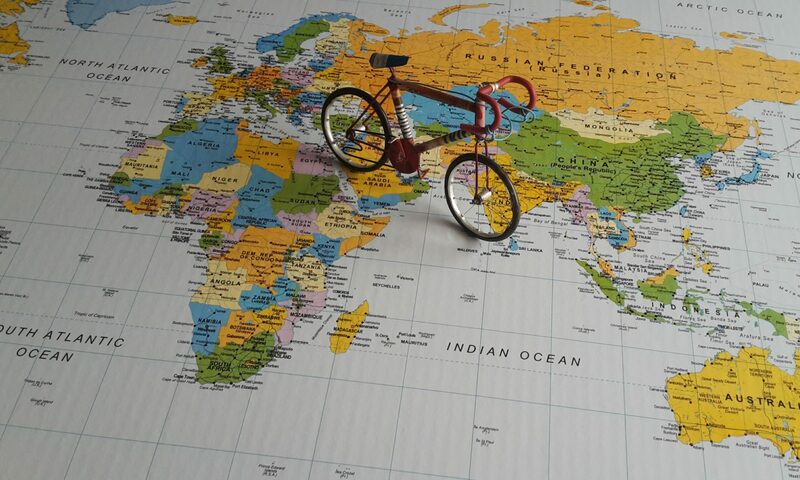 Next PostNext Cycle Touring India Wednesday 12th October. Dhule.